Here it is at last—the novel that will allow American teens to grapple intelligently and thoughtfully with the war in Iraq. 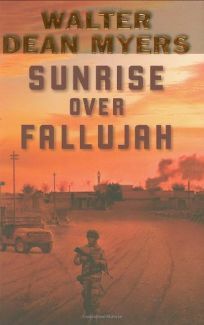 Robin Perry, nephew of the soldier central to Myers's Vietnam novel Fallen Angels , has joined up because, as he fumblingly writes to his uncle on the eve of the invasion in 2003, “I felt like crap after 9-11 and I wanted to do something, to stand up for my country.” Massing in Kuwait, assigned to a Civil Affairs unit, he finds that his motives continue to elude him as he assesses his fellow soldiers, all of whom seem tougher, braver, better directed. Even as the author exposes Robin's ambivalent feelings and doubts, he re-creates the climate of the earliest days of the war, when victory seems definable and soldiers credibly talk in March or April of being home by Christmas.